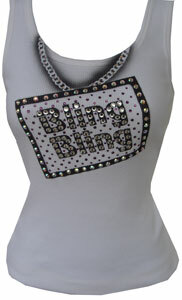 Wear your nameplate on your tee!ﾠ We put anything and everything on a chain or on a nameplate/chain.ﾠ We add extra crystals as shown giving your customized shirt maximum glitz appeal.ﾠ Shirt priced as shown with crystals as shown. Price was $100. now $80!! !